We’ve made our annual Easter sojourn to Ikaria, the Blue-Zone Greek island renowned for the longevity of its inhabitants. Here in Greece, schools get two weeks off, so we’ve already been here a few days and will stay through the whole “Lambro Evdomada,” or “Bright Week,” as the week after Easter is called. 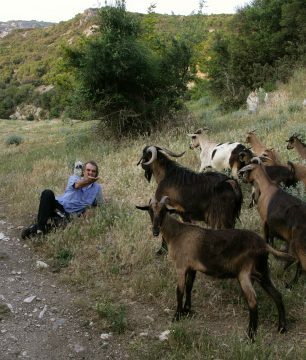 I love to write about the island during Easter, about the rural rhythms that mark the holiday, the communal tsoureki (Greek Easter bread) making at our local bakery, the natural way to dye eggs (with onion skins), the feasting and fun, the goats, wild fennel, and more. But right now, my mind is in prep mode, checking off on a list of the basic foods we’ll need to make the Easter meal. Whether you’re in Ikaria or any other small Greek village, or planning a backyard spit-roast like many Greek-Americans do, or even just planning a simple roasted leg of lamb and a few traditional goodies, here’s a list of the basics and an explanation of each one, to make Greek Easter as traditional as possible. In Greek cuisine and Greek recipes, artichokes are an important seasonal ingredient. Yes, Greeks do artichokes. They grow in several places in Greece, mainly in Crete and the Peloponnese, but also wild. We have wild artichokes on Ikaria, and relish them if we can get to them before the goats do! 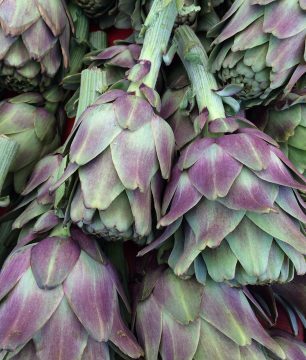 Greece produces large globe artichokes, smaller purplish “iodine” variety artichokes, and wild, thorny, small ‘chokes that are a hassle to clean but worth it because they’re so tender and delicious. The most common way to prepare artichokes is a la polita, braised, that is, with diced carrots, leeks, and dill, and served with avgolemono. 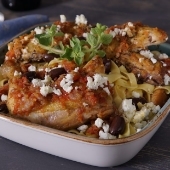 There are some region specific dishes, too, for example, a delicious Easter roast of lamb or goat and artichokes, from the Mani region in the Peloponnese. There are artichoke pies, and artichokes stewed with peas, fennel, dill, and fava beans. 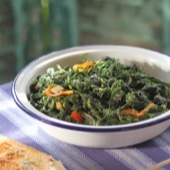 There are salads of raw or blanched artichokes, and artichokes grilled and served with Greek yogurt. You can cheat a little by using frozen hearts, but the flavor is nowhere near as intense as it is from the fresh variety. 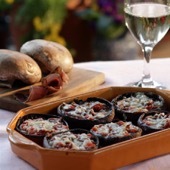 If you love artichokes, take a look at my artichoke recipes, here. I recently heard that most people think of dill as a Scandinavian herb, I guess from all that gravlax! But for us Greeks, dill is one of the defining flavors of the cuisine. We use it in simple salads with Kos (Romaine) lettuce and scallions; in savory pies; in other salads; in the Easter soup, mageiritsa; in rice stuffing’s for the Paschal lamb and so much more. Dill is also one of the herbs that is always used fresh. I’ve moved away from commercial red dyes for Easter and now use onion skins, which lend a deep, dark, rich red color to the eggs and are a totally natural way to color them. 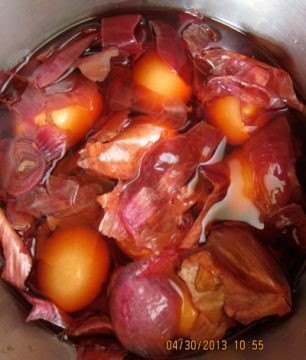 You can see how to dye eggs with onion skins here. It might sound silly to talk about the obvious, but the importance of eggs on the Greek Easter table can’t be understood until you have spent a little time in rural communities where people still fast and still have chickens. From the perspective of sheer practicality, Greek Easter dishes that revolve around eggs (think mageiritsa, the egg-lemon-offal soup; dyed eggs; egg-laden breads; egg-rich desserts; egg-lemon sauce for artichokes, fresh grape-leaf dolmades, lamb or goat fricassee and more) evolved as a way to make use of all the eggs piled up over 50 days of abstention. In Greece, we’re lucky to have access to as much delicate wild fennel as we want, since it grows all over the country, and especially in the islands. In the U.S., I’ve seen it growing wild out of the sidewalk cracks in San Francisco, but nowhere else! You can use fennel bulbs and fronds and a star anise, to replicate the intensity of flavor in the wild kind. At Easter, wild fennel goes into savory pies, rice stuffing’s, Easter soup, and salads. We even make fennel fritters. Delish! 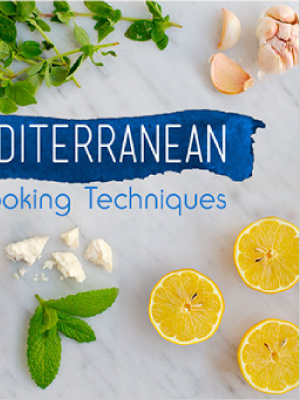 You’ll need flour if you’re planning to make tsoureki, pita (savory pies), and koulourakia. Look for unbleached white, or experiment with whole grain flours. Garlic everything! Garlic goes into the roasted potatoes and is pressed into legs of lamb or whole lambs (or goats) on a spit. It goes into the olive oil-lemon marinade that gets brushed over the spit-roast. 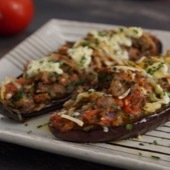 It pairs with artichokes and it goes into tzatziki, another must for the Greek Easter feast. Kos / Romaine Lettuce – Pedestrian as this might sound to an American, this hardy-leafed lettuce is the favorite salad green on the Easter table, married with fresh dill, scallions, and a lemon vinaigrette. Nose-to-tail eating at Easter is traditional, especially in a culture with rural roots and a mindset that lets nothing go to waste. Sweetbreads, brains, heads, hearts, spleens, intestines, livers, kidneys and even testicles, so long as they’re all from your friendly neighborhood goat or lamb, all have a place on the Easter table. I will write a nost-to-tail piece about Greek Easter. 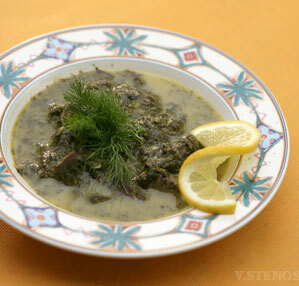 For now, suffice it to say that the most basic Greek Easter food, mageiritsa, is basically a simmering cauldron of almost all of the above, lightened with greenery like lettuce, dill and scallions, and thickened with lemony avgolemono. 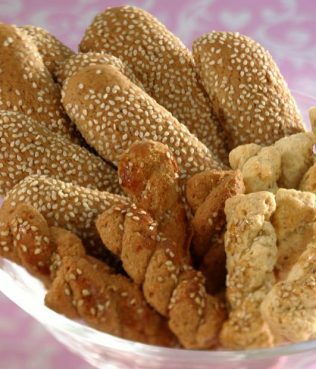 These are the braided and/or coiled Greek Easter cookies that are a tradition on the Easter table. You can find them in Greek shops or you can make them yourself. See recipe, here. How to Roast a Lamb or Goat, this is the question, when it comes to Greek Easter feasts. The answer is multifold and depends on whether you want to roast a simple leg (bone in is tastier) in your home oven, try one of dozens of regional Easter lamb or goat specialties, or attempt to secure a whole animal to a rotisserie for spit-roasting. 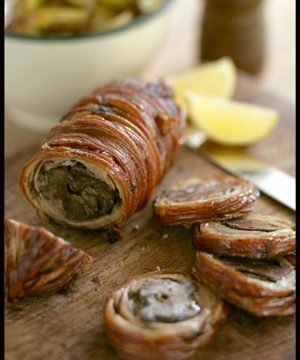 Take a look here for some ideas on how to cook Greek Easter lamb or goat. Recipes are interchangeable. Like oranges, lemons are a must at Easter, not only because of the zest, used in so many breads and sweets, but also because the juice provides the basis for avgolemono, the egg-lemon liaison that pairs beautifully with so many Greek Easter dishes. Mahlepi, a spice used in many Greek recipes, comes from the kernel of a cherry. A most interesting spice. Mahlepi is the kernel of a specific cherry variety. 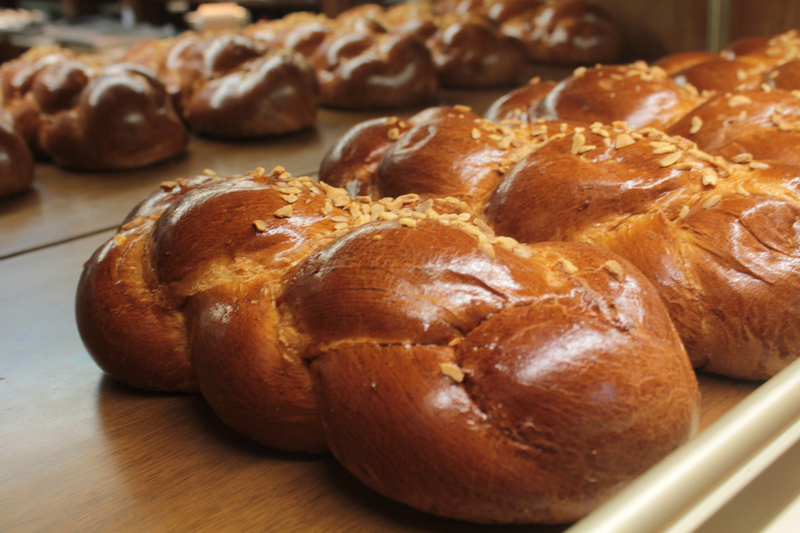 To use it, you either crush it in a mortar with a pestle, or, more effective, boil it in water and let it steep, using the strained infusion to flavor tsoureki, the braided Greek Easter bread. Mastiha, the crystal resin spice from Chios. The world’s most seductive spice! 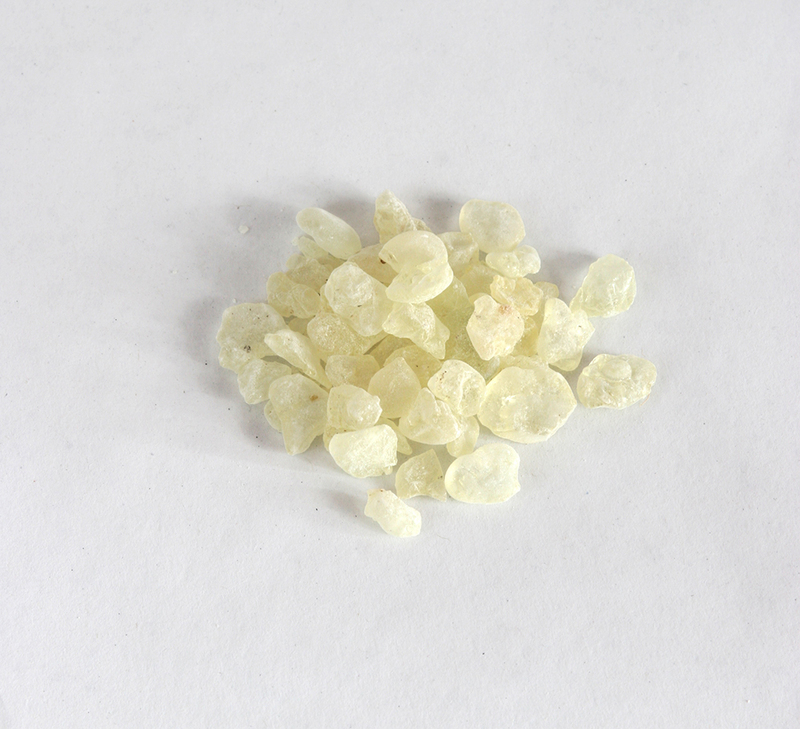 Mastiha is the crystallized resin of the mastic tree, pistachia lentisca. 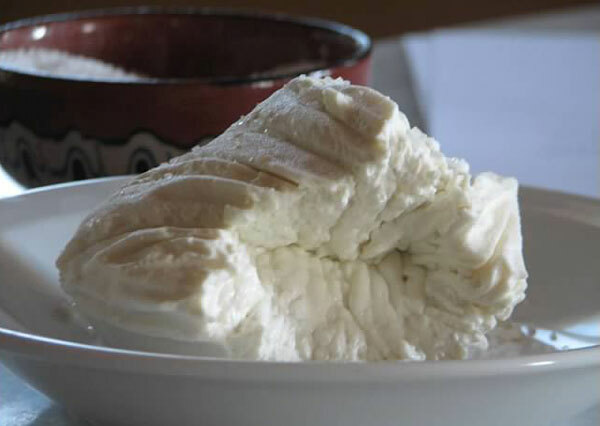 It is produced only on the island of Chios, in 21 “Mastic Villages” on the south side of the island. 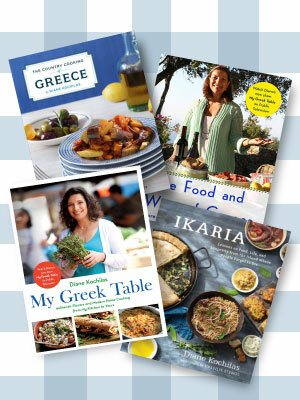 You can buy it online at the www.mastihashop.com or in Greek and Middle Eastern food shops. To use it, you need to pound it in a mortar with a pestle. For tsoureki, which is sweet, pound it with a little sugar; for savory dishes, you can pound it with some salt. 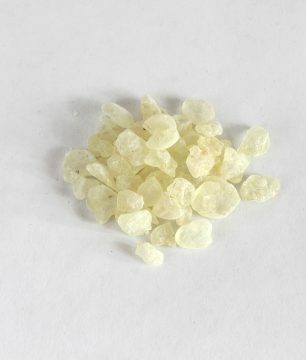 It’s best to buy the small pearly size of mastiha crystals for pounding and use in baking. There are other, larger, crystals, which are great on their own as a natural gum. Mastiha also comes already pounded, but I find it hard to gauge quantities in this form and the spice loses its aroma when bought already pounded. It comes as an essential oil, too, which is pricey but very potent. 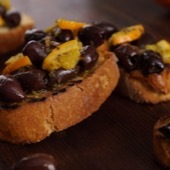 You definitely want oranges on hand, and best that they be organic, because the grated zest is used to flavor tsoureki and myriad sweets. Greek lamb or goat without oregano? No way! In the US, we get mostly Mexican oregano, but I have to say, biased opinion or not, that it pales in comparison to the oregano that grows in Greece, where the salty sea breeze adds an extra dimension of flavor. 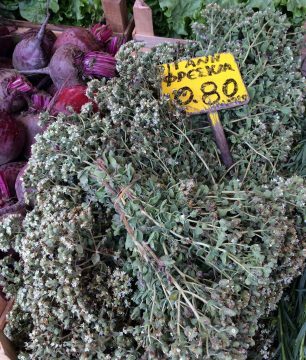 Look for dried Greek oregano in Greek shops all over the country. Go for small new potatoes and roast them whole. Here’s a trick: blanch them first, for 8 minutes, counted from the second they start to boil. Remove them and toss them with olive oil, orange and lemon juice, Greek honey, mustard, rosemary, garlic, salt, and pepper. Roast separately. You’re guests will beg you for the recipe, promise! 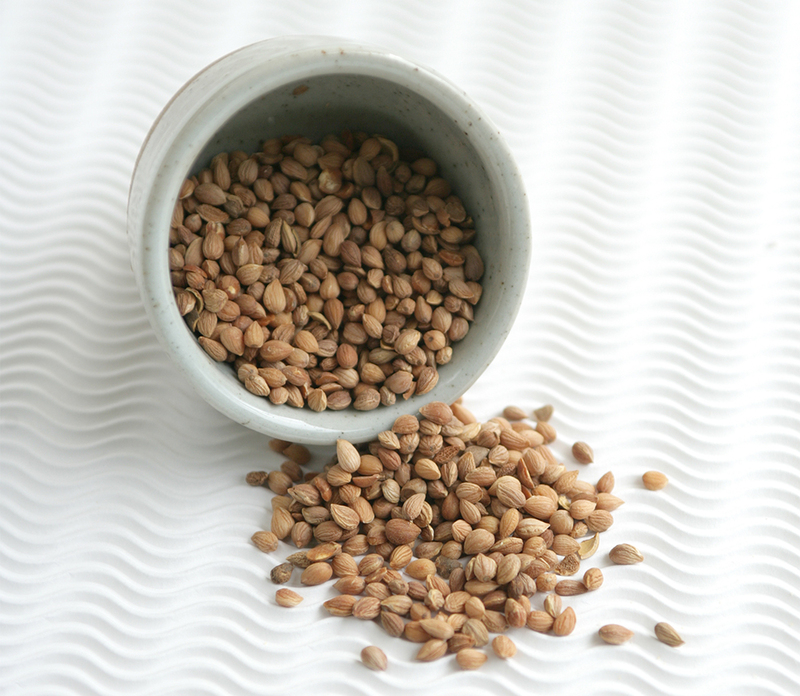 Sesame, one of the most nutritious seeds in the world, is the basis of tahini, which is a Lenten necessity for anyone who goes off dairy (it’s packed with easy-to-digest calcium). 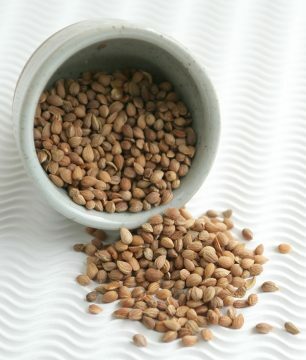 Sesame used to grow in Greece, mainly in the Dodecanese islands and in the north, where it is still processed into tahini paste. 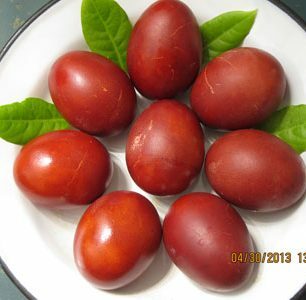 At Easter it is used mainly as a garnish on cookies, cheese-filled pastries, and tsoureki. I toast it to bring out its inherent flavor and use it in salads, too. 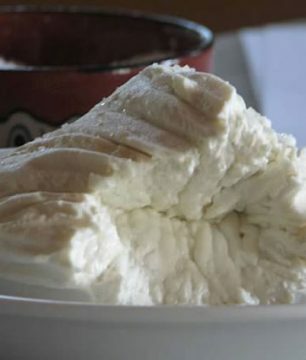 These might be the hardest ingredients to come by in the U.S. Special fresh cheeses in season in the spring only abound all over Greece, and especially in the islands. To simplify, these cheeses are a lot like anthotyro or ricotta, and you could use either to make myriad little Easter pastries. My favorites are the melitinia from Sifnos and Santorini. The braided Easter bread not unlike Chalah in that it is rich in eggs, slightly sweet, and kneaded several times in order to achieve the right consistency and texture. The braiding is symbolic of the Greek Orthodox Holy Trinity (Father, Son and Holy Spirit), and the red-dyed eggs that punctuate the braids represent the blood of Christ. Traditionally, Greek home cooks make tsoureki on Holy Thursday. 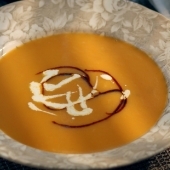 You can find the basic recipe here, or you can opt to buy it. 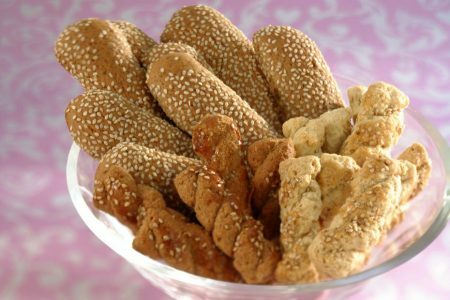 Some of the best is at the Poseidon Bakery in NYC and at Titan Foods in Astoria, which ships. 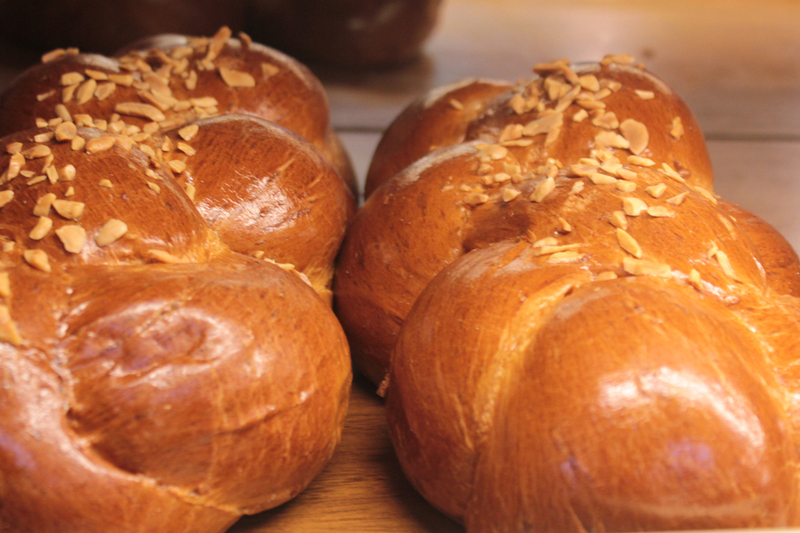 Tsoureki isn’t the only Greek Easter bread. There are, first of all, versions of it, from Poli (Greeks from Constantinople), and from the Peloponnese. There is also a sugary-topped brad called fogatsa from Corfu.